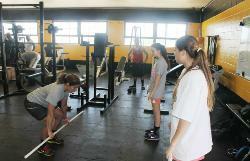 Carrie Rey is Bishop Montgomery's full time strength & conditioning coordinator. Coach Rey designs and implements strength & conditioning programs for each sport for both off-season and in-season sessions. She is certified in CrossFit training and coordinates the strength & conditioning programs for most Bishop Montgomery athletic programs.